One of the priorities of WBA is to assist in the setting up of national or regional bioenergy associations worldwide. 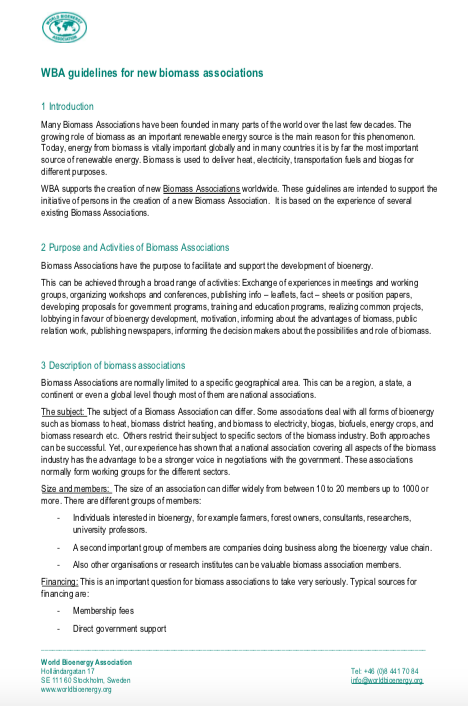 With the mission in mind, WBA developed a Guidebook on setting up national bioenergy asociations (based on Swedish experience). Interested stakeholders can access the guidebook below. The goal of the association should be to engage actors in the whole bioenergy supply chain (see graph), including suppliers, users, traders and equipment manufacturers. Also consultants, researchers and interested individuals should be included. But focus should be on industry, because it gives the best guarantee for a stable economy of the association. Make an inventory of the leading actors in each part of the supply chain. Invite leading persons from these major companies to a preparatory meeting. Talk to some of them beforehand to guarantee success in the first steps. Be certain to include people who are positive to the initiative from the start. Make a proposal from this group of companies/actors and ask them to pledge economic support from the start. Send an invitation to all interested. Make an inventory of all actors in the field, collect addresses and invite them to a meeting to formally establish the association. Start the meeting with some interesting study visit, e.g. to a plant or to a research station. Elect an interim board, responsible for making a proposal for statutes and budget. Set a date for the first general meeting. Be sure to announce the existence of the new association to media and politicians. Take formal contacts with appropriate governmental bodies.